, , Discard a card: Put a 1/1 white Human Soldier creature token onto the battlefield. I'm not sure just how tight your budget is, but I can see a number of easy ways to make some little improvements! If you only go for a single nonbasic land, then Emeria, The Sky Ruin is an excellent choice for providing late-game value. Kjeldoran Outpost and Daru Encampment are also good options, as are Secluded Steppe and Drifting Meadow if you draw them late game when you don't need any more lands. 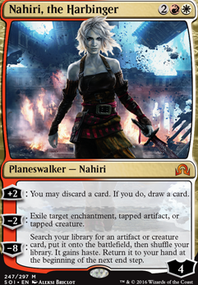 Djeru seems like a very... odd choice if you don't have any planeswalkers. I think that Thraben Doomsayer, Riders of Gavony or Devout Chaplain could all serve you better. By the way, are you sure Hada Freeblade and Kazandu Blademaster are worth it if they are the only two allies in the deck? You might be better off with Champion of the Parish and Hanweir Militia Captain Flip - or Elite Inquisitor, if you liked the Blademaster's abilities. Thraben Inspector or Thraben Standard Bearer could also be run over Champion of the Parish if budget is an issue. Looks like a fun deck! A few things, you're really going to want to address the mana base, you're heavier on the white than green, so I'd run more white sources than green. Lands like Horizon Canopy, Fortified Village, and Temple of Plenty are great budget lands. Since you're running 6 drops, I would strongly recommend going up to 24 lands as well. Anthems like Radiant Destiny, Paragon of New Dawns, and Vanquisher's Banner are very good. Always Watching is also fantastic, but unfortunately does not pump your tokens. Thraben Inspector, great stats for the cost and the clue lets you replace her whenever you need to. Thraben Standard Bearer, which just lets you turn dead cards into soldiers. Thalia, Heretic Cathar Fantastic soldier that can mess up your opponents plans and let you win. Sergeant-at-Arms the versatility this guy offers is very nice. Declaration in Stone Removal is pretty important to staying alive and winning the game. 4x Thraben Doomsayer is in my human deck and I highly recommend it. 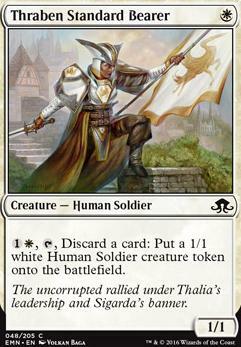 Thraben Standard Bearer make human soldier tokens, but discarding a card is what I am trying to avoid. Aegis of the Gods may help slow down cards like Inquisition of Kozilek. I'm not entirely married to the swords if there are cheaper (both money and mana cost) options to buff and even protect creatures. But Rebuff the Wicked and Dawn Charm would be good to try out until I have money to buy the swords. Shane Oh, no problem. Pauper and Peasant are really similar. 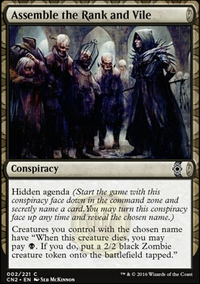 A small number of uncommons are allowed in Peasant but not Pauper. As far as your other suggestions, I had considered Deadly Grub and Beetleback Chief previously and determined that their CMC was too high for their intended purpose. Deadly Grub would be used as sacrifice fodder or free blocks so he would be going away rather quickly. The 6/1 shroud that it leaves behind is definitely not something to be laughed at, but I felt like Dragon Egg (which is the card that takes the grub's spot) was more useful #1. because it can block small threats, and #2. it creates a flier that guarantees a higher chance at getting in damage. But he can definitely contend for that spot depending on whether your meta is flier-heavy or not. Beetleback Chief is essentially 3 triggers for 4 mana in this deck. and yes, one of them is a 2/2 body, which is nice. The tokens are created on entering the battlefield, it allows Undying Evil to do some serious work as well, but I think it just comes down to the mana cost at 4 total with double red. As for Empty the Warrens and Captain's Call, it's the same kind of deal. Empty the Warrens is at best, in this deck, 4 tokens for 4 mana at sorcery speed. I very rarely will have the opportunity late-game to take advantage of storm. Captain's Call just seems underwhelming to me. I think that if you want a heavy hitting token maker like that, you'd want to go with something like Battle Screech or Triplicate Spirits. They have similar CMCs due to Triplicate Spirits' ability, and they have the possibility of creating many more tokens because of flashback, or because of convoke allowing you to cast Triplicate Spirits fairly early. Oh, and they're fliers too so that might come in handy, although it is meta dependent. Icatian Crier didn't work for me for similar reasons. This deck is meant to take over the game around turn 5 or 6, so even if you were able to get her down on turn 3 or 4, you could only probably use the ability once or twice at best. I tend to find myself low on cards in the late game, and finding one to discard might become a problem. Perhaps if you had more card draw in your deck such as Tormenting Voice, she could work for you. Or if you planned to bring the deck into the late game, you could include cards like Terminate and Cenn's Enlistment. Thraben Standard Bearer is a good card to compare to as well. Thanks for taking time to help with some suggestions! First: Thraben Standard Bearer is honestly terrible in this particular deck setup. You have nothing to discard for it other than useless lands. 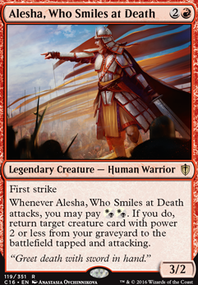 Second: This looks like a token deck, so you should probably have Rhys the Redeemed as your commander instead of just a random creature. You want to have it on the field as much as possible, and it's so easy to kill that you won't have it on the field for more than a turn cycle or two. I would say toss your Thraben Standard Bearer and put Increasing Savagery in. Then toss Midnight Guard and add more Restoration Angel. This should give you a good start. Too much land my dude. Your average CMC is 3, and you only have 3 cards that are above a 6 drop. Since you have ramp in Mirari's Wake, Cultivate, Farseek, Kodama's Reach, Gilded Lotus, the signet, Sol Ring, Somberwald Sage, Yavimaya Elder, Avacyn's Pilgrim, etc you can easily cut at least 4-5 lands and still have too much mana flowing. For card suggestions, if you need budget ones to keep the deck under $300, I like Thraben Standard Bearer (combos with Sigarda) Courageous Outrider (since G/W usually has a harder time with card draw), and Thraben Doomsayer (free tokens). Other than those guys I'd maybe suggest more Tribal/Token enchantments (Doubling Season, Parallel Lives, etc) to buff your humans. Hope this helps!